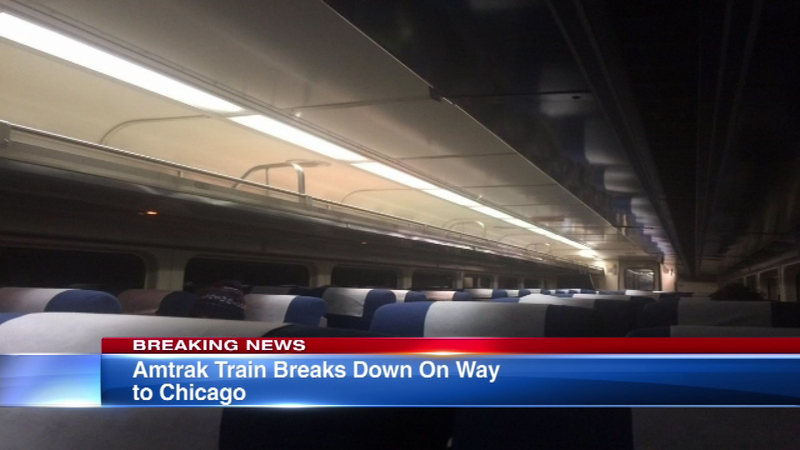 Passengers on board the Amtrak train to Chicago say there are power problems and the bathrooms are not usable. PLEASANT PRAIRIE, Wis. (WLS) -- A motor failed on a Chicago-bound Amtrak train Monday night, causing it to stop for several hours near the Illinois-Wisconsin border. The 338 Hiawatha Service from Milwaukee was stopped near Pleasant Prairie for more than three hours before another locomotive began pushing the train to Chicago. The trip normally takes about an hour and twenty minutes. Amtrak said there were 70 people on board. Passengers on board said there were power problems and the bathrooms were not usable. "The power keeps going on and off intermittently. Anytime the power goes off, it gets cold right away. And then the bathrooms don't work," said Lisa Kaplan, a passenger.